They will chomp anything in their path as they are voracious predators and sight feeders. 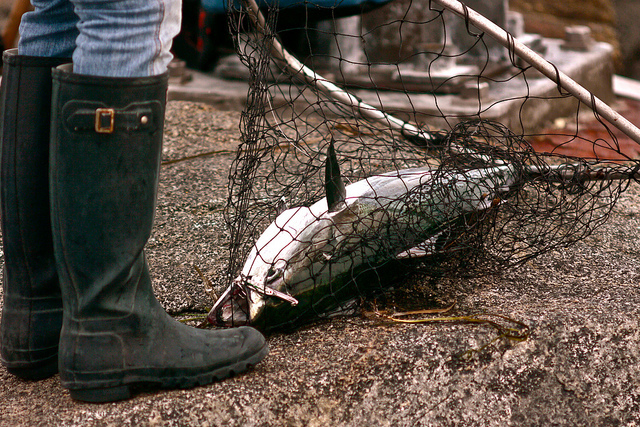 Catching bluefish is a clear test of your fishing experience and expertise. They are so dangerous that even the smaller sized bluefish do not roam with the bigger ones. They are so ferocious that they kill and eat their friends to defuse their hunger when they do not find any other species as food. Smaller blues are always afraid of bigger comrades and primarily travel in groups of like-sized blues. This cannibal’s blood-freezing characteristics made it a perfect target for spring fishing to the sport fishermen community. Bluefish is not only a highly sought-after sport fish but also a restaurant fish because of its great taste. Many party boats exclusively go for fishing bluefish. It is a bit surprising but not uncommon that they can catch 20+ fish per person. So, it is a great fun to catch this fish. Luckily, you can catch them more if you follow some rules. In this compact guide, we will share all these secret rules. If you want to catch larger fishes, fall is the right time. But they will arrive in late spring and stay at least up to October. Depending on the size of a bluefish, its name is determined. Little ones are named as snappers, large ones are named as tailors and the largest ones are called choppers. Fishermen often target tailors and snappers. So, they use medium heavy gear. Some experts will also suggest you use a mono or wire leader to avoid cut-offs as they have sharp teeth. Many captains complain blues often destroy their trout rigs. They travel in large schools. You can fish them by casting, trolling, jigging, chumming and live or dead bait fishing from boats, shores or piers. Use one or more of the methods depending on condition, your equipments and other facilities. To bluefish hunters, chumming from an anchored boat is the easiest way and the most popular way. They throw Bunker chum to attract bluefish. They attach cut bunker with the hook and the drop the hook. The fish cannot distinguish the hook from other chum pieces. But you should always try to use fresh bunker. Fresh bunker is more effective than frozen bunker. 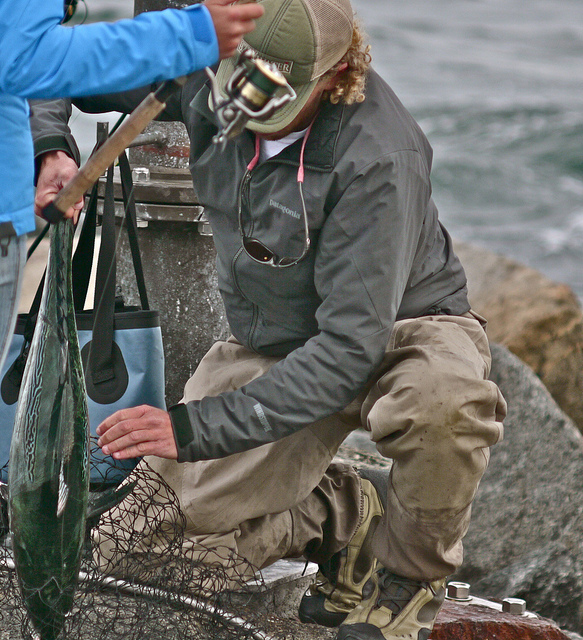 Another tip is – you should not release too much or too little chum. Too little chum will fail to attract them. On the other hand, they will not find any motivation to move around if you release too much as they are getting food easily. If you find a location where birds are diving for fishes, you are at the right place. Diving birds mean there are schools of small fishes. Medium and large bluefish prey on smaller fishes. You should go to the diving area and cast a diamond jig or plug. It is a quick, easy and almost guaranteed way to get bluefish. First, you need to locate them. Once you have located their positions, you can anchor their or drift in that area. But you need to keep your lure down at the right depth and you should troll with wire line or heavy drail sinkers and also down riggers. But wire line trolling is the most effective out of all the available options. To troll, you can use trolling tubes, jigs, umbrella rigs, plugs or even Bunker spoons. Keep your trolling speed somewhere between 2.5 and 4 knots. 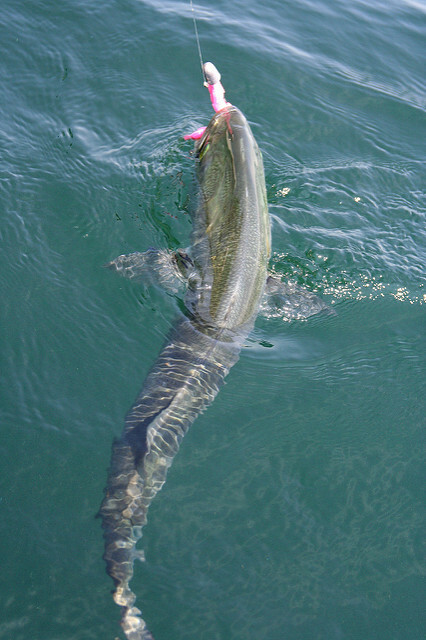 Fishing by jigging is good if there is a large concentration of bluefish. Do not drive your boat at full power because this may drive away the underneath schools of bluefish. Slow down your boat and drift so that you can take your time to locate the position of bluefish. You can also turn your engine off at this time. 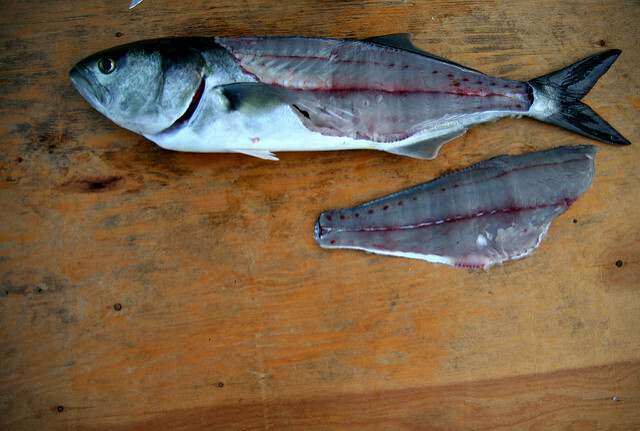 Sometimes larger bluefish stay below the smaller schools. So, it is important you find out the right depth where they are staying. Finally, drop diamond jigs tipped with surgical tubes to the bottom and then reel up quickly. No bait is used. When you cannot spot a large school of blues, bait fishing can be a good technique. You need to go to a place where blues are known to migrate. Since you are fishing in bottom fishing style, you need to spool your 7 to 8 feet rod with 12 pound test line. You need to use bottom rigs. Though wire bottom rigs are suggested by some fishermen, you can increase your catches by using heavy monofilament leaders. Though fresh baits are the best on bottom rigs, bloody cut baits are also very effective. Blues will bite any natural bait such as cut shrimp, sardines, herring, butterfish, sand lances, menhaden, silversides, croaker, mackerel, anchovies, weakfish, spotted sea trout, spot, bloodworms, earthworms, squids etc attached at the bottom. 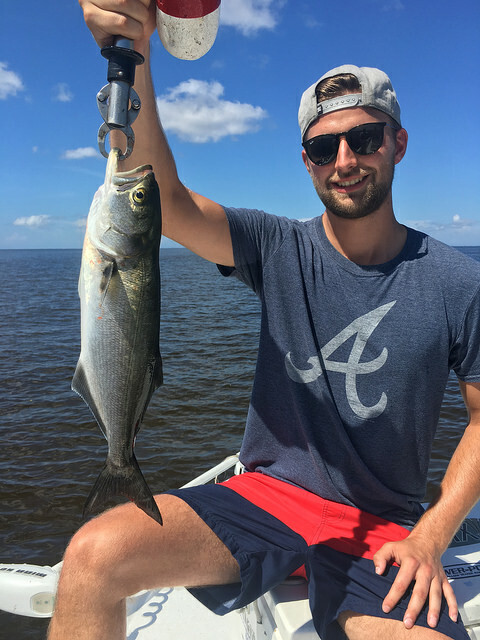 Live baits such as small pinfish, mud minnows, finger mullet, pogies or any other live bait will also work for bluefish. Any kind of fast and shiny lures are ideal for catching bluefish. Classic bluefish lures comes with red head and white bodies. Bluefish is great to teach kids fishing because it is easy to catch bluefish. Sometimes on every cast, a bluefish will bite your bait before it reaches the bottom. You can anchor somewhere blues are roaming and take your time to teach your kids how to fish blues. We have few more tips for you. Bluefish often use their sharp teeth to cut the line of anglers. 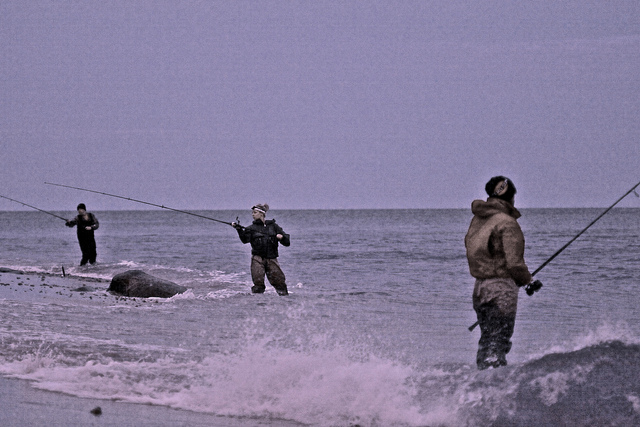 So, anglers often use wire to protect their line from bluefish. Wear gloves while you are fishing because several fishermen were severely bitten by bluefish. They are so dangerous that it is suggested no one wade or swim among feeding bluefish schools. Be very careful when you are removing the hook out of the fish. Try to always use pliers or some other type of hook remover. Never use fingers to unhook them. Keep your boat in gear while you are fighting a fish. This way you can easily tire it out. Do you have any question fell free to ask it. All image have being taken from flickr. No more today, Have a nice day.